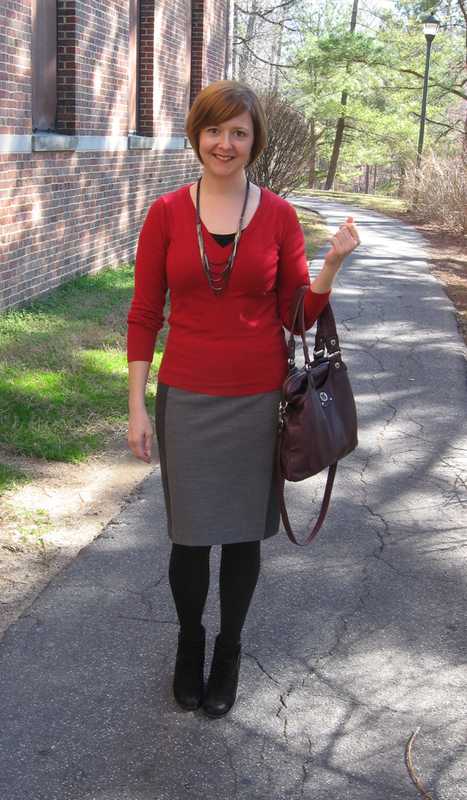 Ooh, look at me doing the color blocking thing months and months after everyone else. Go me! This Ann Taylor skirt is kind of magical, though, with it's strategic optically slimming thing going and I love that the back panel is black because, yeah. It just makes sense that way. (That business does not need enhancing.) The sweater...well, we just won't talk about that. I think this is one of my favorite outfits from you in months! What? No! I think she looks awesome? bani says: there I go again with my hopeless sense of humour. I know what you meant, I just saw a joke about subtle digs in it... Sorry! I think Adrien looks awesome too, obviously. That's an amazing skirt - looks great on you. Also, like the new photo location! You look GREAT in that outfit! I'm going to hunt that skirt down RIght. Now.